There are few aromas more unpleasant than bad dog breath. Even though your pooch may assume you appreciate his kisses, if he’s boasting bad breath, there’s little to enjoy. Rather than retracting and avoiding your pups affection, this is a sign that something deeper and more problematic is happening that needs to be addressed asap. Let’s take a closer look into what causes bad breath in pets so you can help avoid this potentially life-threatening issue once and for all. The single most common cause for blatantly bad breath is insufficient oral hygiene. Yes, dogs need to have their teeth brushed too! 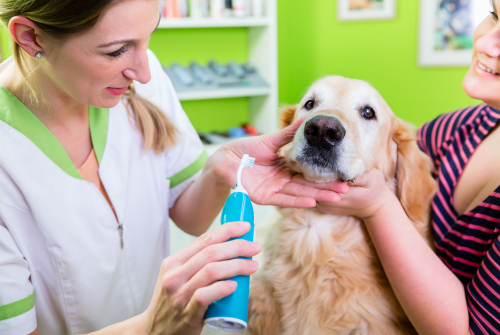 This can be a point of contention among pet owners who either don’t want to brush their pet’s teeth daily or don’t have the time in their busy schedule. Regardless of any resistance, you may have to this daily chore, its importance cannot be understated. Four out of five dogs over the age of three have some form of periodontal disease (gum disease). This is a very painful, potentially life-threatening condition that is at the root of the issue. If you do a quick internet image search on ‘pet periodontal disease’ you’ll quickly see why. This condition begins with bacterial and plaque buildup on the teeth. Over time this causes inflammation of the gums that leads to problems under the gumline. Once bad bacteria make a home under the gumline, the problem progresses very quickly into root infection, toxic abscess, and bone loss. This also causes serious bad breath. Left too long and this infection can cause organ failure and even death. Dogs somehow almost universally love eating cat poop. This is a great recipe for bad breath if ever there was one. Some dogs even like eating their own poop (or the poop of other dogs). This is a known condition – coprophagia – and will most certainly cause foul oral odor. Some dogs have access to rotting garbage, decomposing animal carcasses, or other foul snacks. These can also contribute to foulness of breath, and putting an end to the unsupervised snack time will help get rid of the issue. A more immediate emergency could be lurking under the foul odor. If your pet is vomiting, has yellowing gums, is losing their appetite, and has foul breath, your pet may be experiencing a liver problem. This is a sign of a serious underlying medical issue and required attention immediately. Visit the local animal hospital at once. If your pet’s breath smells like urine, unlike poop breath, it’s not because they are drinking pee. There is a chance that your pet is experiencing problems with their kidneys and requires immediate veterinary attention. Like in liver disease, this suggests a larger underlying health issue that needs to be addressed. Almost the opposite of bad breath, but worth mentioning, is if your dog’s breath smells sweet and fruity. Ruling out diet (like a quickly inhaled strawberry that dropped off the counter), a sweet and fruity oral aroma is also a symptom of diabetes. This is a serious but treatable condition. If you suspect your pet may have diabetes, schedule an appointment with your vet to have it looked at. The best way to ensure you prevent bad breath is to establish an oral health routine that includes daily brushing, chew toys, and yearly dental check-ups (with a cleaning). Establishing a regular routine from a young age is your first line of defense against bad breath and everything that comes with it. Treating bad breath, if it’s related to bad oral health, is part of a professional dental appointment. During a dental exam, if any signs of periodontal disease are present (at any stage of progression), then the issue can be dealt with accordingly – often taking care of the bad breath on the first treatment. If bad breath is a symptom of a larger organ problem or systemic disease, treatment is rendered accordingly. Getting to the root of what causes bad breath in pets is a task every pet parent has to address at some point or another. Don’t fall into the trap of thinking that horrible breath is normal – it’s not. Treating the underlying issue is a top priority and can help make sure your pet is not suffering a painful problem right under your nose. If your pet has foul breath, give Snodgrass Vet a call at (270) 207-9257. We can set you up for a wellness visit and go over everything with you.